I know, can you believe it, I posted two days in a row! And this is my second post today! Kristina's color challenge today was So Saffron, Certainly Celery, Bashful Blue, and Close to Cocoa. I made two cards, but I like the top one better. I used my nestabilities to cut my two bigger circles, my 1" punch for the saffron circle, and my star punches. I stamped the star in celery on scrap paper, then used my SMALL star punch to punch out the middle, then used my large star punch to punch the whole star out of the scrap. The star is popped up with dimensionals, and I added a button, a sentiment, and the ribbon. I love the retired set Fresh Fruit! 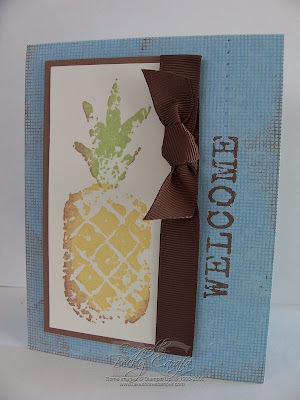 I inked up the pineapple base with saffron ink, then rolled the edges in cocoa ink. I did the same thing with the stem, except with celery and cocoa inks. I mounted it on a piece of cocoa paper and tied a chocolate ribbon around the edge. I inked up my Canvas background in bashful blue ink, and rubbed the edges in cocoa ink to make it look a little distressed. I mounted the pineapple on the base with dimensionals, stamped the sentiment in cocoa craft ink, and added some piercing (that you can't really see). My favorite is the "small wonder" card with the star -- very cute! So cute! Love your cards for the color inspiration challenge. Both are fabulous! Alright girl, why doesn't SU! just hire you? These look like they came right out of the catalog! Amazing and cute, Becky! I love the baby one the best, too! Awesome job! These are both fabulous, Becky! Awesome job with the color inspiration challenge! Great cards!! I love the first one with the circles and star..it is so clean and kinda preppy! LOVE these! IT's a great color combo, and that star card is so clean and simple, it's stunning!! Both of these are very beautiful, and I love the colors!! I don't know which one I like better they are both amaZING! I agree, I like the top one the best, but they are both super cute!!! These are fabulous. Love the layout on the "small wonder" card. Love the first card (the second one is great too)! I love the clean and simple look of it. This is SO very pretty! I'm subscribing to your blog right NOW! Thanks for leaving a comment on my blog! It helped me find some serious talent here on lakeshore stamper! Love the first card too! Love the small wonde sentiment! both of these are great. I love seeing an "oldie" stamp used. I really love the first card, though. those circles and the star-it all just looks great together. Becky, both cards are gorgeous, but the small wonder card is sooo my style and definitely gonna get cased by me! I always enjoy your blog even if I don't always comment!